Researchers at the University of California at Irvine (UCI) said that's exactly what they were doing when they discovered how to increase the tensile strength of nanowires that could be used to make lithium-ion batteries last virtually forever. The problem they have encountered, however, is that nanowires are also extremely fragile and don't hold up well to repeated discharging and recharging, known as "cycling." For example, in a typical lithium-ion battery, they expand and grow brittle, which leads to cracking. 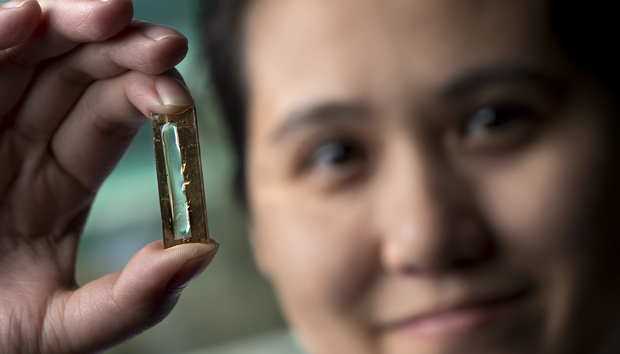 UCI doctoral candidate Mya Le Thai solved the brittleness condumdrum by coating a gold nanowire in a manganese dioxide shell and encasing the assembly in an electrolyte made of a Plexiglas-like gel. The combination, they said, is reliable and resistant to failure. The findings were published today in the American Chemical Society's Energy Letters. Hard work combined with serendipity paid off in this case, according to senior author Reginald Penner. "Mya was playing around, and she coated this whole thing with a very thin gel layer and started to cycle it," Penner, chair of UCI's chemistry department, said in a statement. "She discovered that just by using this gel, she could cycle it hundreds of thousands of times without losing any capacity." "That was crazy," he added, "because these things typically die in dramatic fashion after 5,000 or 6,000 or 7,000 cycles at most." Thai, the study's leader, cycled the nanowire-enhanced electrode up to 200,000 times over three months without detecting any loss of capacity or power and without fracturing any nanowires. "All nanowire capacitors can be extended from 2000 to 8000 cycles to more than 100,000 cycles, simply by replacing a liquid electrolyte with a... gel electrolyte," the researchers wrote in their paper. "The coated electrode holds its shape much better, making it a more reliable option," Thai said in a statement. "This research proves that a nanowire-based battery electrode can have a long lifetime and that we can make these kinds of batteries a reality."